According to the Labor Department figures, the US economy added only 142,000 jobs in September 2015, lowering the chance of an interest rate rise this year. The number of jobs created in September was far lower than the 205,000 increase forecast by economists. The July and August figures were revised down by a combined 59,000. On October 2, Wall Street opened sharply lower, with the Dow Jones and S&P 500 indexes both down about 1.3%. However, both indexes later recovered to be up about 0.5% and 0.6% respectively. The poor figures also resulted in a rollercoaster ride for the FTSE 100, which ended the day up 0.9% at 6,129.9 points despite also turning negative in afternoon trading. The Labor Department numbers reinforced fears that the China-led global economic slowdown is hitting America’s recovery, adding to doubt about whether the Federal Reserve will raise rates before 2016. The number of new jobs for August was cut by 37,000 to 136,000 – in sharp contrast to the upward revision expected by economists. The July total was also reduced, by 22,000 to 245,000. The number of new jobs created in the US has averaged 198,000 a month for 2014 – below last year’s average of 260,000. However, the unemployment rate held steady at 5.1%. 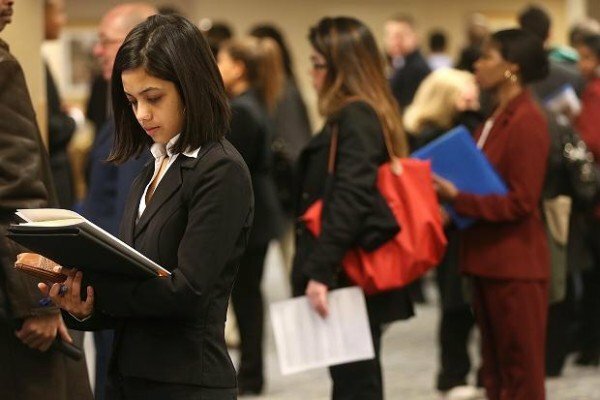 The jobless rate, which is derived from a separate survey of households, was unchanged only because 350,000 workers stopped looking for work last month and were no longer counted as part of the labor force. The proportion of Americans who either have a job or are looking for one fell to a 38-year low, partly reflecting retirements of older workers from the baby boomer generation. Average hourly wages fell by 1 cent to $25.09 during the month and were only 2.2% higher than the same month in 2014. The data also knocked the dollar lower, with the pound rising 0.6% to $1.5238 after the numbers were released. Yields on government bonds also fell.